It's been an unusual week, and while it may have started on a sour (tasting) note, it has ended on a sweeter one (although that Safari was sickly sweet). Most of us don't think India when we think whisky, or vice versa, but India consumes bucket-loads of whisky. They drink almost 6 million litres of Scotch whisky a year, but that is nothing compared to the total 570-million they down in total. The SWA would argue that most of the 'whisky' consumed in India is not whisky at all. So when is whisky not whisky? When it is made from molasses and not grain, say the SWA and the EU. They also believe that India has protectionist domestic tariffs that create fiscal discrimination against Scotch whisky, the major obstacle to Scotch whisky reaching its sales potential in the country of 1Billion people. By contrast, Indian spirits have free access to EU markets... so long as they don't call their molasses-based spirits 'whisky'. It has created a slight trade war in recent years that has been quite exciting to follow. I have no more time to write about it this morning, so read up on it yourselves (if you are interested) HERE, HERE, and wherever else you would like to look. We had the regular Amrut yesterday. 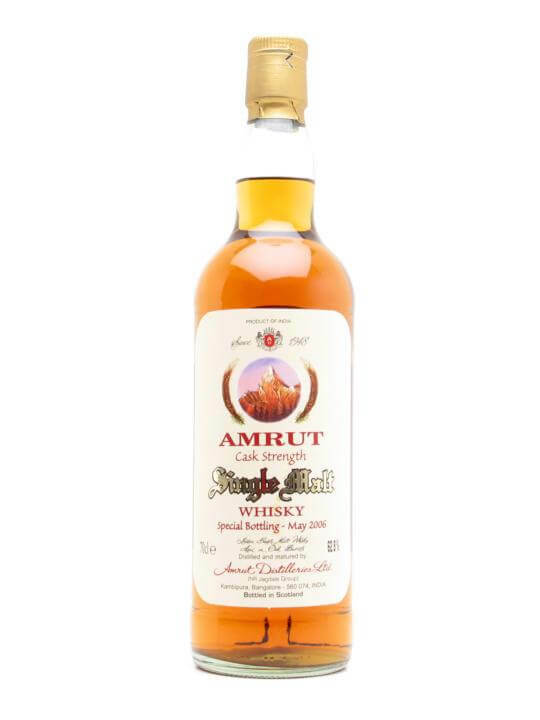 Amrut Cask Strength was launched in 2006 and has already sold out of three batches. Love him or hate him, Jim Murray scored Amrut Cask Strength (1st ed., 62.8%) a 94/100. Oily and sweet, but somehow dry, full of booze and good news. Vanilla, coffee cake. Some forest floor, like mushrooms and leaves, with lots of oak, too. !*#£*&%! Hot and exciting. Sweet and sour, dry and chewy. Malted barley, oat cakes, honey, sugar coated breakfast cereals, and a firm handshake of oak. Big. Big oak, big malt, from a big country. Flavours delivered in burly handshakes and firm fistfuls but balanced and very-well structured. Surprising, and delightfully so.